Dr. Matt Morris has been in practice since 2014. Originally from Rockford, Illinois, Dr. Matt vacationed in Florida with his family with grandparents who lived there. He vowed that when he grew up, he’d live here to enjoy the beauty of the Sarasota area. After his graduation from Palmer College of Chiropractic in Iowa, he made the move and met his future wife. 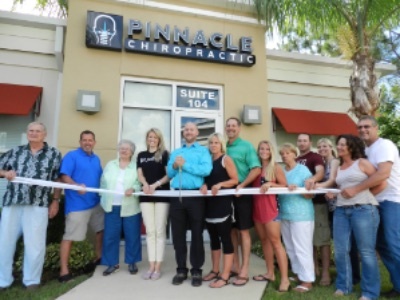 They love raising their daughter in Lakewood Ranch, with Dr. Matt providing the highest quality of natural health care at Pinnacle Chiropractic. Dr. Matt’s passion is assisting children, particularly those with special needs such as neurodevelopmental disorders. He’s a member of Epic Pediatrics and has the privilege of seeing incredible successes happen every day with his patients. Under Dr. Matt’s care, your child’s nervous system function can improve so that they can have greater control over their body. Meltdowns and tantrums are lessened, and other incredible changes can be seen, such as improved immunity. Often, a mom will bring their child in to see us and soon join our practice as well. Dr. Matt enjoys treating moms who are stressed, have anxiety or depression or are feeling burned out, fatigued or can’t sleep at night. Expecting mothers are welcome, too, who can be empowered to fulfill their dream birthing plan with the help of chiropractic care. Dr. Matt saw a boy whose mom called him after just a week of care. He’d been having issues in school that she sought help for. She said her son had been to his tutor, who reported that for the first time, the boy could concentrate on his work. A 4-year-old boy was experiencing a speech delay and could only say one or two words at a time. After a couple of weeks, the mom reported that the child was talking, could participate in the end-of-the-school-year event and wasn’t having the meltdowns that used to disrupt his life. His speech improved, too, and he was speaking in full sentences. Contact our chiropractic care center today to get started! We’re happy to offer complimentary consultations so that you can find out more about what we do.